Hemel Hempstead Town suffered their first National League South defeat of the season as a solitary goal from Jay May was enough to hand Maidstone United all three points at Vauxhall Road tonight. The Tudors went into the game on the back of three straight wins at the start of the season, having beaten Dartford, Chelmsford and Weston-Super-Mare in their opening trio of fixtures. Hemel were again short on numbers due to a raft of injuries, but Tudors boss Dean Brennan was able to welcome back Dennis Oli into the starting XI following a knock picked up against Chelmsford. Hemel started the game brightly and the first shot at goal came from Tudors skipper James Potton but he was unable to keep his effort below the bar. The hosts were well on top in the opening 15 minutes and continued to press in search of the opening goal; Jamie Slabber, Matty Harriott and Matt Spring all tried their luck, but the Maidstone goal remained unbreached. Potton came close on 20 minutes, firing a side-footed attempt just wide of the right hand upright, but Maidstone began to find more of a foothold in the game as the half went on. It was still Hemel creating all the chances, though, and they should have opened the scoring after 25 minutes. Dennis Oli was crudely brought down, and Spring delivered a wicked free-kick but Hawkins could only head against the post from two yards out after a slight touch feom Maidstone keeper Lee Worgan. It was Hawkins again who tried his luck for Hemel next as he got his head to a floated delivery from Ben Herd, but the ball drifted narrowly over the bar. Mitchell Pinnock had Maidstone’s first real attempt at goal with a stinging left-footed strike, but Tudors keeper Jamie Butler was more than equal to the effort, before Alex Brown curled a shot wide as the visitors started to press further forward towards the end of the first half. The away side picked up where they left off at the start of the second period and it was the visitors who opened the scoring within five minutes of the restart as centre-forward May was left unmarked in the area to finish from close range to break the deadlock. United skipper Steve Watt came close to adding a second for the visitors soon afterwards, but his header looped onto the top of Butler’s goal. 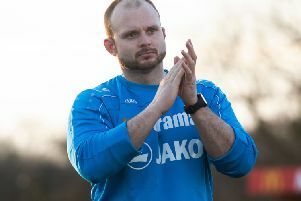 May fizzed an effort narrowly over, and Hemel boss Dean Brennan responded by replacing captain Potton and Oli with the fresh legs of Jamal Lowe and Willy Gnahore. Hemel started to up the intensity and they came agonisingly close to an equaliser when Michael Richens met a Spring corner with a powerful downward header, but the ball was cleared off the line. That proved to be the last real chance of note, as Maidstone held out well to bag the three points and leave the Tudors empty-handed.